If there is a requirement to refresh large schemas/tablespaces within a databases regularly it is worth considering using transportable tablespaces (TTS). This method is ideal for moving large data quickly thus minimising downtime. The time taken will depend on the size of the data files being moved and the amount of DDL contained, but generally speaking the operation will not take much longer than the time to move the data files. Interestingly TTS forms the basis for the new pluggable databases to be delivered in 12c, there is a “plugged_in” column in dba_tablespaces which will be set to “yes” after using TTS. There are some limitations which can be found in the link below, but in the most cases we are able to use TTS. If we are refreshing using point in time data, where there is no requirement for real time data, we would use RMAN backups to create our TTS sets. This means there is no effect on our source system i.e. no need to put the tablespaces into read only mode for the duration of the copy. I recently transported sits_data and sits_indx in STARDUST(target) from STARTEST(source) using an RMAN catalog and a recent backup of the source db. 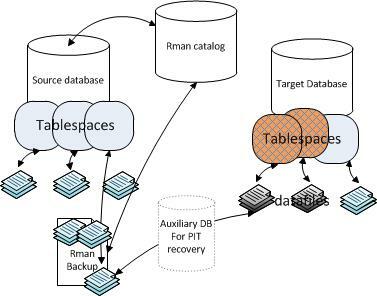 RMAN will handle the creation of an auxiliary database for you to facilitate the point in time recovery of the desired tablespaces. You are already using an RMAN catalog to backup the source system. The target system already exists. There is adeququite space for another copy of the data files. login to source oracle server as oracle. This will create a dump file and import script which will be used to import the ddl into the target db. The tablespacess are now available in STARDUST.